What to See in the 20th Arrondissement of Paris? Taking up large swathes of the city's northeast, Paris' 20th and last arrondissement (municipal district) is a traditionally working class area whose immigrant roots, stately Père-Lachaise cemetery and surprisingly quiet stretches lend a particular charm. This unpolished, complex beauty-- never pretty, but often haunting nevertheless-- perhaps explains why the area and its diverse inhabitants were so extensively documented by photographers such as Willy Ronis. It's also why artists and students have flocked to the area in recent years, attracted by lower rents and space for studios, an interesting and edgy nightlife scene, and a distinctively metropolitan feel that diverges from the postcard-perfect Paris you're probably accustomed to. This is what makes the area so interesting, in the end: it's not postcard-shiny but exudes real mystique and a kind of old-world depth. 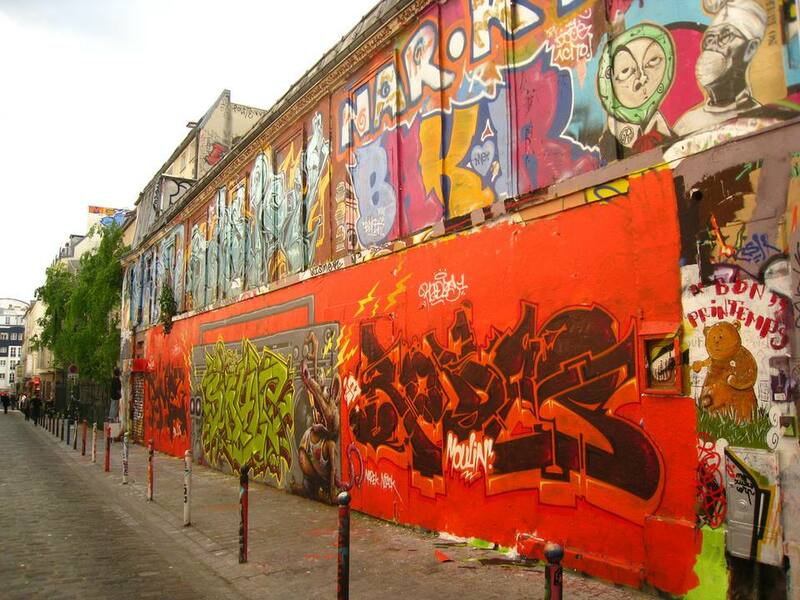 Whether you wish to explore the colorful street art on Rue Denoyez (pictured) after grabbing an inexpensive beer at one of the area's bohemian bars, enjoy a steaming bowl of Vietnamese Pho or Chinese noodles in a nearby eatery, catch an indie-rock concert up at popular venues like La Bellevilloise, or pay homage to Oscar Wilde, Jim Morrison, or the fallen combatants of the Paris Commune over at Père-Lachaise, the 20th offers a dizzying array of things to do. Boredom is simply not an option here. The city's largest arrondissement, the 20th comprises the neighborhood known as Belleville (shared with the 11th arrondissement), as well as the Gambetta/Menilmontant area north of Père-Lachaise. You can read more about these individual neighborhoods and their highlights by following the links above. The easiest way to get to the 20th is to take line 2 or 11 on the Paris metro to the Belleville, Pyrenées, Menilmontant or Père-Lachaise stops. The 20th offers an appealing mixture of cosmopolitan speed and quiet, subdued beauty. You can stroll in one of the area's gorgeous parks or cemeteries for a little contemplation, before heading out for a night out in one of Belleville or Menilmontant's indie rock clubs. Also make sure to check out the annual event known as the Ateliers Ouverts de Belleville, an open-house event which sees the area's artists open their studios and galleries to the public for free. Nestled just off of Rue Ménilmontant, La Bellevilloise is one the Belleville's most coveted spots for live music, a beer, or a light meal (hippie-inspired salads and cheese plates reign here). Also check out La Maroquinerie next door, also well-known for its live sets. Further east toward Gambetta, La Flèche d'Or is yet another hotspot for nightlife. Read our complete guide to Belleville for suggestions on places to eat in the area, including excellent Chinese and Thai cuisine. Also see suggestions from Paris by Mouth, and also visit Felicity Lemon, a newer addition to the small-plates restaurant concept in the city. If you're vegetarian or vegan, the good news is that the 20th is one of the city's most accommodating areas for non-carnivores. In addition to the many Asian restaurants in Belleville that have long offered non-meat dishes, a new cluster of more experimental, cosmopolitan vegetarian eateries is currently forming around a few streets in the, in what some are dubbing the city's first "veggie village"! This is one of the least expensive areas of the city for accommodations, making it an attractive choice if you're on a budget and are willing to step off the beaten track. One hotel I can personally recommend is Mama Shelter, a hip, modern hotel near Gambetta (read my review). To find the perfect hotel in the area and read about hotels in the 20th enjoying top ratings with visitors, see TripAdvisor (read reviews and book direct). Because the 20th is one of the "grittier" areas of the city, and (unfortunately) many people associate ethnic diversity with potential danger, some visitors wonder whether it's safe to stay here. My answer is a definite "yes", but do exercise caution at night in certain areas known as harboring some criminal activity (mostly pickpocketing and open-air prostitution): Boulevard de Belleville and Boulevard de la Villette, in particular, can be unpleasant or feel a bit "sketchy" especially for women traveling alone. I'd avoid at night. The area around the Porte de Bagnolet metro station might also be avoided after dark. However, I want to reassure readers that as a general rule, the 20th is as safe as the rest of the city.